The U.S. Food & Drug Administration recently put down a final ruling to ban the sale of many antibacterial soaps, after concluding that the risks outweighs the benefits. In this article, I’m going to tell you a little more about the ban and what it means, and share five natural antibacterial options that are much better than than the nasties out there. What’s the dirt on antibacterials? But when put to the test – manufacturers failed to demonstrate to the FDA that antibacterial ingredients are both safe for long-term daily use and more effective than plain soap and water. What does the FDA ban mean? Within one year, manufacturers will no longer be allowed to market soaps and washes that contain antibacterial ingredients like Triclosan, and 18 other chemicals that are not safe, and not effective. Health experts have been actively pushing the FDA to ban Triclosan since 1978 – with growing concerns of interfering with children’s hormones and promoting antibacterial-resistant bacteria. Finally, after nearly 40 years and a recent lawsuit – the FDA took some action. Woot, go get ’em, Mae! The FDA ban is a good first step. But, Mae Wu points out that these chemicals can still show up in your products. The good news is that at home, you have access to natural ingredients that can keep you skin healthy and clean. There is so much available to you and I love showing you new ways to simplify… so here are five natural antibacterials that clean your skin. Tip: while you’re washing your hands: Sing row-row-row your boat three times – and then you’re done! Was used by ancient Romans to treat battle wounds and infections. It helps your body fight infection and prevent the growth of bacteria. You can also use honey directly on your skin as a cleanser. It’s very good if you have pimples or breakouts. In the spice world, both cinnamon and clove rank highest in terms of antibacterial properties. You’ll find that many hot climate countries tend to use these spices in their food. They inhibit the growth of bacteria. My Body Glow Oil from the SIMPLIFY Skin Autumn collection infuses both cinnamon and cloves – use it right after a shower. Vinegar has been used in household cleaners, for it’s antibacterial properties. When properly diluted, a little apple cider toner can help to cleanse your skin and prevent breakouts. It’s not all about killing bacteria, friction removes bacteria and cleans your skin. Make yourself a body scrub and use it once a week in place of soap. 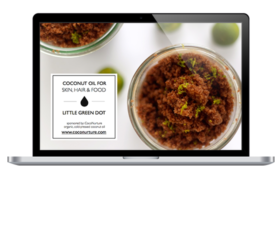 Coconut oil is a good choice for your scrub, it’s naturally antibacterial and wonder skin cleanser. If you’re scrubbing your face, make sure you use very gentle, fine grains and don’t apply too much pressure. Your body loves a good scrub – go in circular motion moving from your limbs up towards your heart. It’s going to help stimulate your body to improve circulation and detox from the inside too! Want to learn how to put all these natural ingredients together? Recently, I launched my latest collection of natural skincare recipes, called SIMPLIFY Skin Seasons: AUTUMN. It’s packed full of naturally cleansing, antibacterial and delicious smelling ingredients, made from whole foods, which you can use to make the most amazing luxury skincare products. I’ll show you step-by-step with videos and recipes books, measuring guides and ingredient swap-outs how to get naturally clean and clear skin. Get your free starter kit today and kick bad skincare to the curb! The problem of diseases being spread by dirty hands is not just that antibacterial soaps aren’t doing as good a job as they promise it’s that the public is not washing their hands adequately enough, according to the Center for Disease Control and Prevention (CDC). I am always buying doctor prescribed meds from mygenericpharmacy or any other online store. There are lots meds and solutions available online at amazon, ebay, walmart, mygenericpharmacy etc. I’m looking for an alternative to liquid anti bacterial body wash. Due to diabetes the warm weather forms bacteria.. Anti bacterial body wash alternative would be considered or naturals will be even better.. I am looking for an alternative to liquid antibacterial hand soap for hand washing, it has to be strongly antibacterial but without the chemicals. If I add clove oil to liquid soap would that work I wonder? Hi Gem! Isn’t the best?! I love using it all over my face, it feels very soft and clean after!